Fiery: The dallae khursani is consumed fresh, not dried. It’s my pet theory that you have never really explored a new destination till you’ve seen its market. It was with this in mind that I set off to the floor above the local taxi stand in Gangtok. Extreme pressure on real estate and not much in the way of flat land means that Gangtok has many examples of unlikely business “tie-ups": The loan-disbursing department of the state government shares space with a popular restaurant; an upmarket curio store doubles up as a cyber café and every cigarette stall does roaring business in car-mirror danglers. So it was no surprise that the city’s vegetable market was located at the shared taxi stand (as distinct from the outstation taxi terminus). And what a treasure trove the market was! 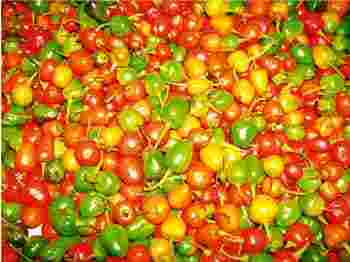 The flaming scarlet cherry-like objects were the tear-inducing cherry peppers, one of the hottest chillies of the region, though they pale in comparison to the bhut jholokia of Nagaland. Dallae khursani, as the fiery devils are called, are only sold and consumed fresh — never dried. If you don’t think you’ll be able to make it to the market again soon, you can buy dallae chutney, sold in plastic containers in multiples of 100g. There are mushrooms on sale that look like enoki but are not, a vegetable that resembles asparagus spears but is not, ferns, nettles, dried and fresh yak cheese, bamboo shoots and fermented soya beans and an intriguing vegetable that the vegetable seller assures me is “sweet karela". There are three varieties of tiny dried fish, though God knows that Sikkim is far off from any sea; loads of common vegetables such as gourd, okra and tomato, even spices such as cumin, coriander seeds and panchphoran in deference to the tourists, many of whom are from West Bengal. The strangest thing is that in spite of a thriving local cuisine, all you get in restaurants (besides shahi paneer and mutton korma) are momos and thukpa. Had I not buttonholed a near stranger and begged him to host me for a Sikkimese dinner, I would never have stumbled upon the delicacy of sliced, steamed bamboo shoot with crumbled chhurpi, the locally made paneer. Cooked minimally, it was accompanied by thick slices of steamed pork; Sisnu, a subtly flavoured soup of nettle leaves; and an intriguing vegetable dish made of mustard and other leaves collectively called gundruk and only eaten fermented. If gundruk was surprisingly close to Korean kimchi, Sikkim’s kinema or fermented soy beans is very similar to a popular Japanese cold starter. There’s a curious reluctance on the part of hoteliers and restaurateurs to serve tourists the food of the state: It seems almost like a conspiracy to keep it a well-guarded secret and to unleash one culinary cliché after another on visitors. You cannot even call Sikkimese food bland: not with fresh dallae khursani and the pounded version to eat with your rice. Sikkimese food does not take long to cook. There are no spices to speak of — only fresh red chillies. The only similarity with Indian cooking is the other ingredients added along the way: ginger, garlic and onions. Although Sikkimese chhurpe (which means curdled milk and usually refers to fresh paneer or to the dried version, which is a hard rock-like substance — an acquired taste) is often made of cow’s milk, as opposed to yak’s milk, it has a completely different taste from regular paneer, having more of a fresh, milky flavour. Heat the butter in a kadhai or wok, add the onion and sauté till translucent. Add the ginger and garlic and stir continuously to avoid sticking to the wok. Then add the mashed paneer and salt. After the water content of the paneer has evaporated, add the chillies, stir to mix thoroughly and serve.